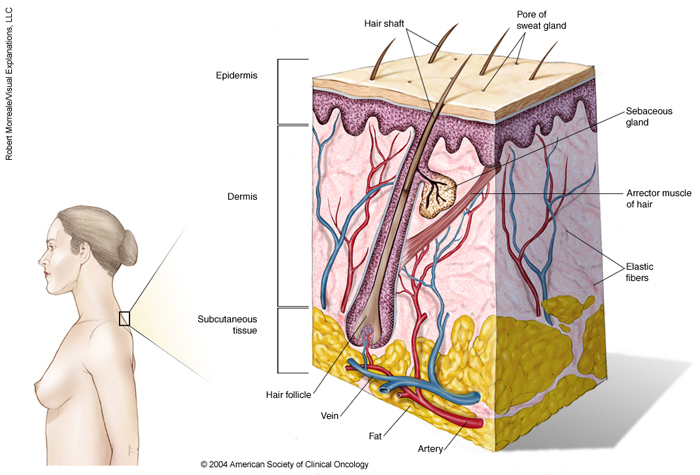 ON THIS PAGE: You will find a basic drawing of the structures and layers that make up the skin. Use the menu to see other pages. This illustration shows the many layers of the skin. The thin top layer is the epidermis. Under the epidermis is the dermis, which is the inner layer of skin. Under that is the subcutaneous tissue, which is a deep layer of fat. The dermis is largely made up of elastic fibers. It also contains hair follicles, which are nourished by veins and arteries that run throughout the dermis and subcutaneous tissue. Small muscles, called arrector muscles, are connected to the hair follicle, as are sebaceous glands. The shaft of hair grows up out of the hair follicle and through the epidermis, which also contains pores for sweat glands. Copyright 2004 American Society of Clinical Oncology. Robert Morreale/Visual Explanations, LLC. The next section in this guide is Risk Factors and Prevention. It explains what factors may increase the chance of developing this disease. You may use the menu to choose a different section to read in this guide.